The colorCONTROL MFA series colour sensor systems has been design to inspect multiple objects for colour and intensity variation. A large area of application has been the monitoring of LED light arrays and user panels in the white goods industry. 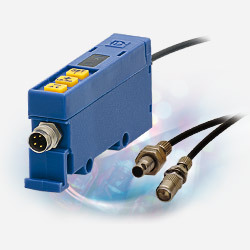 Upto 100 fibres can be connected to one controller offering a very competitive price point. The system can configure each measurement point (fibre optic) individually for true colour RGB-I values and all 100 points can be measured simultaneously, within <1sec. The true colour measurement can be used to either output a simple pass/fail signal or the HIS and RGB-I values of each measurement point can be output via Ethernet, USB and RS232. The colorCONTROL MFA system can be supplied in 5,10,20,55-100 optical fibre channel systems with upto 5m fibre lengths. Click on the table for further information and downloads.